With the development of each new datalogger, our engineering team finds innovative ways to make each better than the one before. When initially released, the CR6 was an incredible improvement over the CR1000. These design improvements of the CR6 were then implemented into our newest datalogger, the CR1000X. However, the creative loop of innovation while designing the CR1000X resulted in improvements even beyond those implemented in the CR6. Now that the CR1000X has been released, our design team has integrated these additional improvements back into the CR6. Here are a few significant upgrades to our CR6 datalogger that will provide the same user experience now enjoyed with the CR1000X. Most notably, the integrated web page. Like the CR1000X, the CR6 will now include a standard default web page that provides easy user interaction with the CR6 from the web browser. These improvements are made possible by the increased flash memory (from 32 MB to 128 MB) and hidden drive (10 MB). Increased internal data storage is provided by an additional 72 MB of flash memory. RG channel will now allow 0-20 mA or 4-20 mA loop current measurements. Like the RG1 and RG2 channels on the CR1000X, the single RG channel on the CR6 provides a nonisolated loop current measurement. Because of the significance of this upgrade to the CR6, the new CR6 will only operate with operating system (OS) CR6.Std.07 or higher. If an older OS is loaded to a new CR6, the operation will be rejected. In other words, loading an older OS onto a new CR6 will not work. The new OS (CR6.Std.07) can be loaded onto an older CR6; however, if a function introduced in the new OS does not work with the older CR6, then there will be a compiling warning when the program is compiled. The newer CR6 can be easily identified by the double blue stripes next to the CR6 on the label, the serial number of the CR6 (must be greater than SN 7502), and through the Status table RevBoard field (Status.RevBoard, should be 019.001) seen when using our LoggerNet Connect screen or Device Configuration utility (see below). 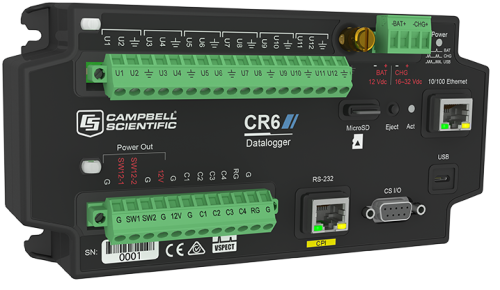 The CR6 upgrade shows our commitment to continually improve our dataloggers. This commitment allows our data-acquisition systems to be the most robust, flexible, and low-power on the market.